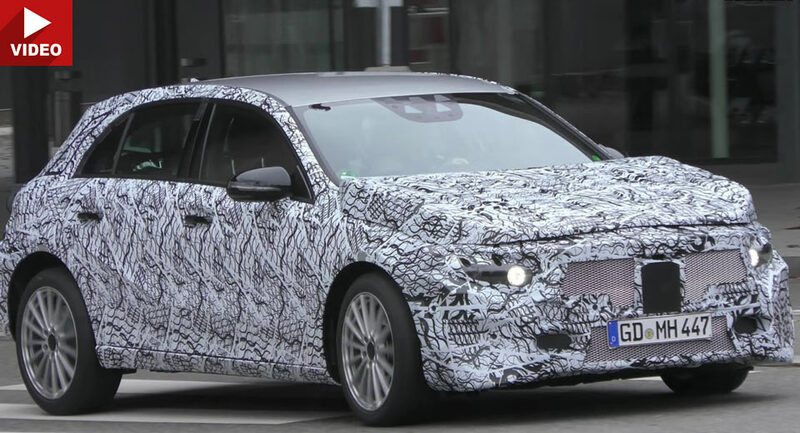 The new generation 2018 Mercedes A-Class has been filmed in motion. An official debut is expected in 2018. New spy video via Walko. While the particular design details remain under wraps, literally, the shape of the new model is clearly more sporty – with a steeper windscreen and a flatter roof. The basic proportions remain broadly similar, though. Under the ball dress we find the upgraded MFA platform, known as the MFA2. Weight is said to go down (at least 50 kg) while the wheelbase is also expected to grow by 2 centimeters, which should generate more space for the rear passengers. Inside, more space, a larger trunk and more comfort creatures. The driver receives a higher quality cockpit, a head-up display and a touch screen. On the engine front, Mercedes will offer an all-new generation of gasoline and diesel turbos with a power spectrum ranging from 150 to 194 hp. The smaller diesel engines will continue to be supplied by Renault. In addition to the AMG 45 version (400 PS), Mercedes could also slot a new AMG version in the line-up. Power output: 280 hp round. When it comes to hybrid technology, the A-Class will also join the race for zero emissions. The pure electric range should be around 100 km. Interestingly, Mercedes-Benz is also considering the expansion of the current line-up, preparing a four-door sedan (direct competitor for BMW 1-Series Sedan) and a larger SUV with seven-seat, tentatively called GLB.